While carmakers have raced to add the latest technologies to their vehicles, the roads they drive on have arguably failed to evolve at the same pace. Now, an odd couple based in the Netherlands hope to change that with visions of self-illuminating weather warning signs painted on to the tarmac, and a dedicated lane capable of recharging electric cars on the go. The pair are Daan Roosegaarde, an artist famous for wacky interactive projects, and Hans Goris, a manager at the Dutch civil engineering firm Heijmans. Mr Roosegaarde's past efforts have included a dance floor with built-in disco lights powered by dancers' foot movements, and a dress that becomes see-through when the wearer is aroused. Heijmans spends much of its time working on more sober schemes, such as city centre car parks and shopping centres. As unlikely as the pairing sounds, the two men believe their smart highway concept has the potential to revolutionise motorways. The project is dubbed "Route 66 of the future" - a nod towards the US highway which connected Chicago and Los Angeles in the 1920s. Tellingly the route - which was decommissioned in the 1980s - also serves as a warning of what can happen if infrastructure fails to move with the times. I was completely amazed that we somehow spend billions on the design and R&D of cars but somehow the roads - which actually determine the way our landscape looks like - are completely immune to that process - Mr Roosegaarde says. "They are still stuck in the Middle Ages, so to speak." 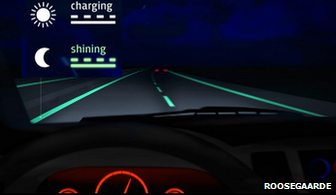 One of the innovations he dreamt up involves painting road markings with glow-in-the-dark-paint. The idea is that a "photo-luminising" powder contained in the substance would charge up in the daytime and then slowly release a green glow at night, doing away with the need for lamps. "When we started this project [Heijmans] was working on an energy-neutral street light, trying to work with solar panels and things like that," says Mr Roosegaarde. "And then we went back to the drawing board and came up with these paints which charge up in the daytime and give light at night." Coming up with such an idea is one thing, turning it into reality another. This is where Mr Goris' technical expertise comes into play. "You're talking about large amounts of crystal that need to be mixed with the paint," he explains. "They make these crystals these days with certain additives. One of them is Europium... it increases the quality of the crystals by a factor of two or three. "We would like to use [this] outside of cities, in rural areas where there's no lighting." 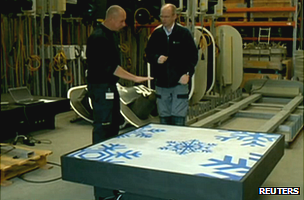 The two men also plan to use another temperature-sensitive paint mixture to create giant snow flake-shaped warning signs on the roads. 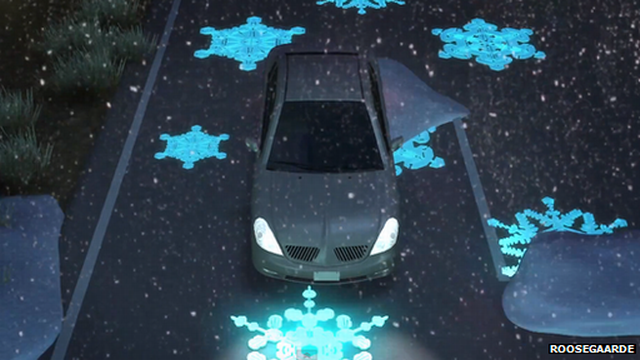 The patterns should glow when sections of the tarmac become cold, warning that they may have iced over and become slippery. Tests have already been carried out on wood-based mocked-up sections of motorway in Mr Roosegaarde's studio at Waddinxveen, about 45km (27 miles) south of Amsterdam. Heijmans now plans to fund an outdoors trial on a strip of road at Brabant, near the Dutch border with Belgium, later this year. The two men also advocate more costly updates. One involves creating an "induction priority lane" containing built-in coils capable of recharging electric cars as they pass overhead. The idea may sound like something out of science-fiction, but similar technology is already being used to power a "cable-free" tram system in Bordeaux, France. Efforts to bring the innovation to roads are already being worked on at Stanford University, Canadian transportation firm Bombardier, US chip maker Qualcomm and German engineering firm IAV among others. "If you're able to recharge vehicles while driving you can limit the amount of batteries or extend the range that they have," explains Mr Goris. "I don't foresee that every motorway in Holland will have a third or second lane available with coils that charge your vehicle, but at specific locations you could think of it." The two Dutchmen also have another trick up their sleeves: small turbines placed at strategic locations to take advantage of wind generated by passing vehicles. Attached to each one would be an LED light, providing a free source of illumination to mark the motorway's edges. "We figured out that in front of and after tunnels there is an enormous amount of wind flow that is not being used at all, which you can easily take and use," says Mr Roosegaarde. Mr Goris adds that it would also be ideal to place them in the middle of roads to take advantage of the breeze generated by cars rushing past each other in opposite directions. "It looks good on paper, it works," he says. "But new roads are built in Holland with a middle barrier of [between] 10 to 20 metres so you lose the effect of the wind. "However, we don't look at these ideas only for the Dutch market. If it helps other people in different countries to come up with practical ideas we would love to show the idea there and have somebody else continue with it." It's still early days for these ideas and they may ultimately remain pipe dreams. But tech writer and BBC Click regular Bill Thompson believes such efforts are to be commended. "Unless you've got someone who is willing to take the risk of saying things that may sound very silly you're never going to make progress," he says. "The problem is that a lot of money is already invested in road building using traditional materials... it's not that these aren't brilliant ideas, but how are you going to deliver them."